Purchase any specially marked Coca-Cola, Coca-Cola Vanilla, Coca-Cola Light, Sprite, A&W or Fanta (Orange, Strawberry or Grape) in 325ml CAN, 24-CAN Multipack, 500ml, 1.25litre, 1.5litre or 2.0litre bottle, and Minute Maid Pulpy (Orange, Tropical, Citrus and O'Mango) in 250ml and 1.0litre bottle. Pull the ring tab/closure and look underneath for the code. If your code is "EUR", "JEY", "FBL", "CAP" or "WP" ("Winning Code") please call 03-8023 8311 by 30 June 2012. You are required to answer a promotion-related question correctly in order to win the respective prize. The Question is "Who is the official soft drink sponsor for UEFA Euro 2012™?" 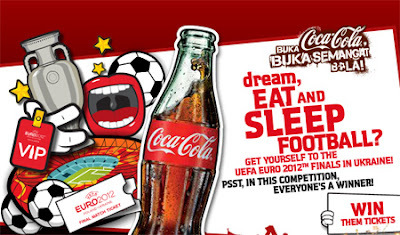 Visit Coke - EURO 2012 website for more detail. Go to Australia! Take your pick - Brisbane, Perth or Sydney? Great flight offers! !